Great article. I’ve become interested in proper motion only recently, due to a curiosity in my neck of the woods. A carving about 10 ft long on a boulder looks like it may be that of the big dipper (or plough I think if your British) but from an earlier period. It took me at least 2 years to surmise this. Thanks! Did you know that Stellarium is free? Just click the word Stellarium in the story. It’s a link to a download — Mac or Windows. This article makes me wonder after many of the Sci-Fi’s I’ve read wherein future FTL travelers don’t seem to take time compression or dilation into consideration… The simplest way to deal with the problem seems to be to ignore it – this includes most Star Trek and Star Wars episodes/sagas. The Siri of the future must use one heck of an advanced version of Stellarium to get around – eh? Imagine Capt. Kirk and crew traveling mega parsecs at warp 7 then coming back to Star Fleet headquarters only to find Sol has moved and the neighborhood has become unrecognizable, with Star Fleet no longer in existence… That would’t do much for a story line, now would it? Absolutely true! If Kirk and the rest traveled that fast, they’d have to work hard to find the sun and Earth, both of which would have moved on. It is interesting that that point is seldom brought up in SciFi. If you were traveling at FTL then the sky you were traveling toward would be shifting as you saw the light at an accelerated rate. In “First Contact” by Murray Leinster, first published in 1945, it is mentioned as a result of the speed the ship is traveling. The “Crab Nebula” (I believe) is seen evolving in front of the crew’s eyes. I don’t recall any other scifi story making note of this, but logically, even a “Warp Drive” though “Hyper Space” would result in you seeing the Orion Nebula as it looks right now, and not as we see it 1300 years in the past. There’s a painful way to see the Crab Nebula evolve — falling down a black. As you turn around to look back, the universe appears to age rapidly. So can I claim naming rights for the NEW North Star in 92.000 ? Why, licensing fees alone should mint me a fortune. 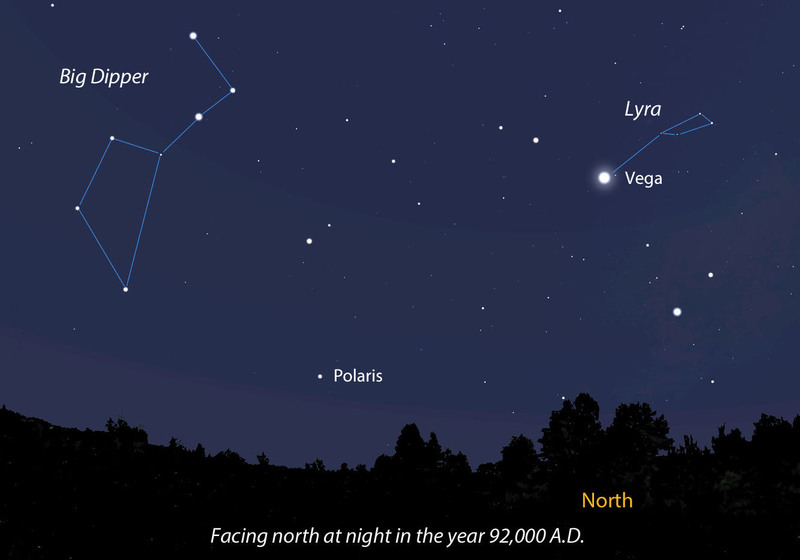 Unfortunately you can’t name the North Star because it’s already named: Vega. Several others including stars in Draco, Cepheus and Cygnus will also have that title during the 26,000 year precession cycle. Not to worry…the Dial-Home-Device can make the adjustments…..